If it's remarkable, it ought to be here. If it's not here, submit it to Discussion Group. Since its introduction in the summer of 1999, the eXtended Finite Element Method (X-FEM) has enjoyed a considerable level of success and popularity from researchers in the computational and applied mechanics communities. In just under six years, several hundred peer-reviewed journal articles dealing with fundamentals or applications of the X-FEM and related methods have appeared in the literature. This post provides some background on the method and comments on its capabilities and usefulness for the broad applied mechanics community. We also welcome questions from the community in the comments area following the post. The X-FEM grew out of research into meshfree methods by the computational mechanics group at Northwestern University directed by Ted Belytschko. Related methods include the Generalized Finite Element Method (G-FEM) developed at the University of Texas at Austin and Texas A&M University. 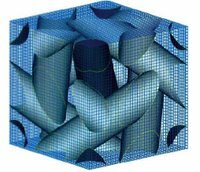 The basic philosophy of the X-FEM is that features of interest in a problem, for example crack surfaces, phase boundaries, and fluid-structure interfaces, can be represented independently of the finite element mesh. As a result, simulating the evolution of these features is greatly facilitated. This is particularly true when they exhibit changes in topology, such as when multiple crack fronts merge or a single crack front branches. The finite element mesh need not explicitly "fit" these features with the X-FEM, circumventing the need to re-mesh in many cases and facilitating adaptivity in others. The Figure below shows an example of the evolution of a phase boundary in a hydrogel as simulated using a fixed mesh with the X-FEM. The sharp gradients in the deformation (observable in the deformed mesh on the right) have been captured using enrichment. The basic ideas behind the method are easy to understand. Most finite element approximations to bulk fields (e.g. 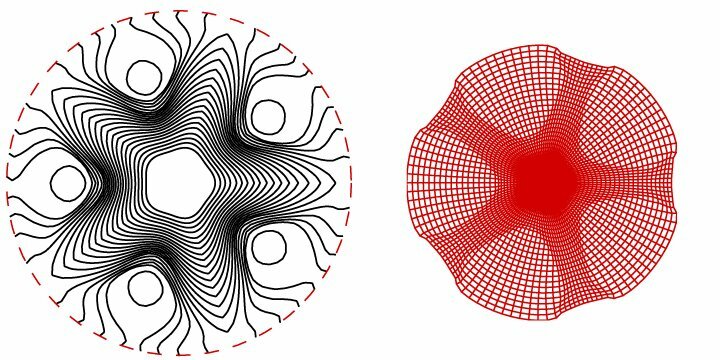 displacement, temperature) can be expressed as a linear combination of nodal shape functions. These shape functions are only able to represent discontinuities in the bulk fields if the mesh is constructed in a particular way. For example, the classical approach to representing the jump in displacement field across a crack front is to explicitly mesh both crack faces. With the X-FEM, the classical mesh need only overlap the geometry of the crack front and does not need to be carefully aligned with it. The linear combination is then augmented with enrichment functions that capture the jump in displacement field across the crack. Crack growth can in turn be simulated through the identification of additional enriched nodes and a new construction for the enrichment function, a process that is typically much simpler than re-meshing. If additional information about the solution is known---such as the asymptotic behavior of the crack-tip fields---it can also be included in the enrichment to garner coarse-mesh accuracy. The mathematical underpinnings behind this construction---the partition-of-unity method---were established by Ivo Babuska and colleagues at Maryland in the early nineties. Although the X-FEM was originally designed for linear elastic fracture mechanics, it has since been adapted to a wide range of applications. These include the representation o f complex microstructures, multi-phase flow, virtual surgery, and general fluid-structure interaction problems. Recently, many researchers have coupled the X-FEM to the Level-Set Method, a technique for representing surfaces through implicit functions. The combination is a powerful one for simulating evolving boundary value problems. Although similar fixed-grid techniques have been used by the finite-difference community for some time, the variational framework naturally employed by the X-FEM makes the incorporation of enrichment straightforward. In addition to new applications, research into fundamental issues continues at Northwestern University, Ecole Centrale Nantes, the University of California Davis, and Duke University, among others. 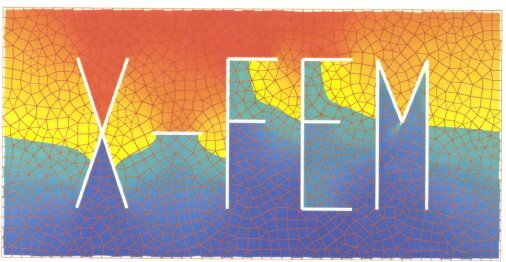 Many X-FEM researchers maintain websites dedicated to the method and its applications, and interested readers are encouraged to seek them out. What a powerful method !